Stacy Horn » Blog Archive » Welcome to New York Nadine and Company and HAPPY BIRTHDAY! Welcome to New York Nadine and Company and HAPPY BIRTHDAY! Nadine, a reader of this blog, is visiting NYC with a friend this week and I wanted to say hi! Apparently they brought the president with them, so thank you for the all-day gridlock, Nadine and friend!! (Kidding.) But it’s also their BIRTHDAYS. Speaking of which, I prefer the cupcakes at the Cupcake Cafe on 18th between 5th and 6th, and a great place to eat lunch is on that block, City Bakery. So if you have time, you could go to those places one day, but you should definitely get birthday cupcakes at the Cupcake Cafe. burgers and cupcakes-is that the dream meal of a five year old…or what ? a little bit o’ trivia-the killjoys at the Blgd. 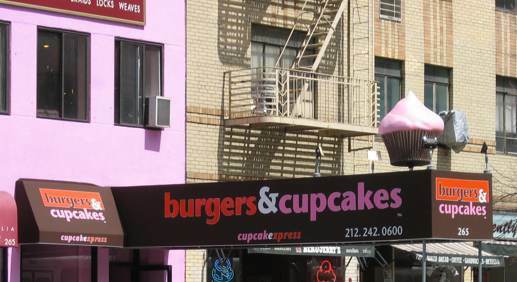 Dept cited this establishment for both the giant cupcake and the extra long canopy. not sure what is wrong with the cupcake, but the canopy (alledgedly) would interfere with the operation of fire apparatus. Too close to the street !!! Awww. That was a nice thing to say. Please tell me how everything went/is going, what you saw, etc. I live in the Village!